I think that every homeschool family has certain companies that they come back to year after year. One of the companies that keeps popping up in our family is Memoria Press. Memoria Press is a classical Christian education program with materials that cover all subject areas. They are perhaps best known for their Latin programs (Prima Latina, Latina Christiana, and more). 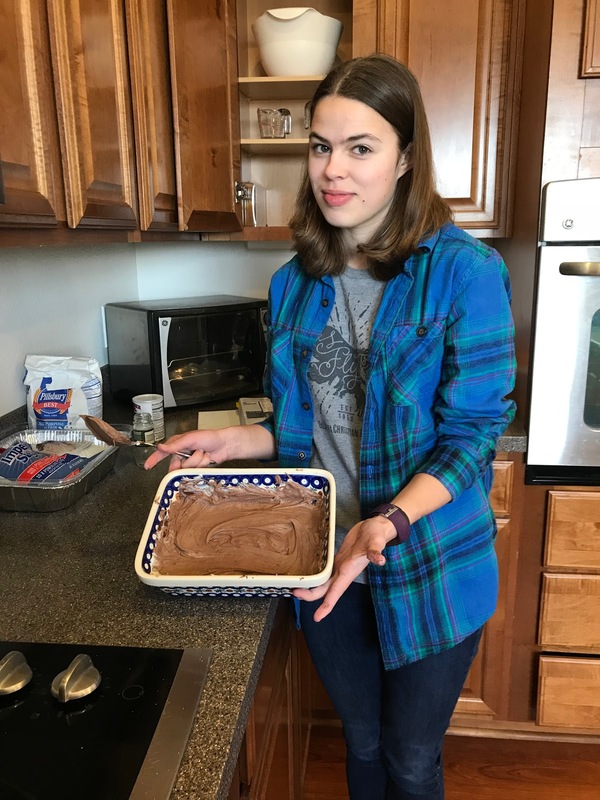 I have used several of their products with Lauren, and most recently she is using their materials to work through a literature study of Mr. Popper's Penguins by Richard and Florence Atwater. Recently, we had the opportunity to use Memoria Press's Poetry for the Grammar Stage Set, another part of their literature options. For classical educators, the grammar stage is roughly defined as kindergarten through 5th or 6th grade. The product description notes that "poems increase in difficulty as students move through the book over a four-year period." Since Lauren is at the upper end of the grade recommendation, I introduced these materials with the intention of working through the poems all at once -- sort of a unit-study on poetry to make up for all the years that I didn't add poetry into our other language arts work. 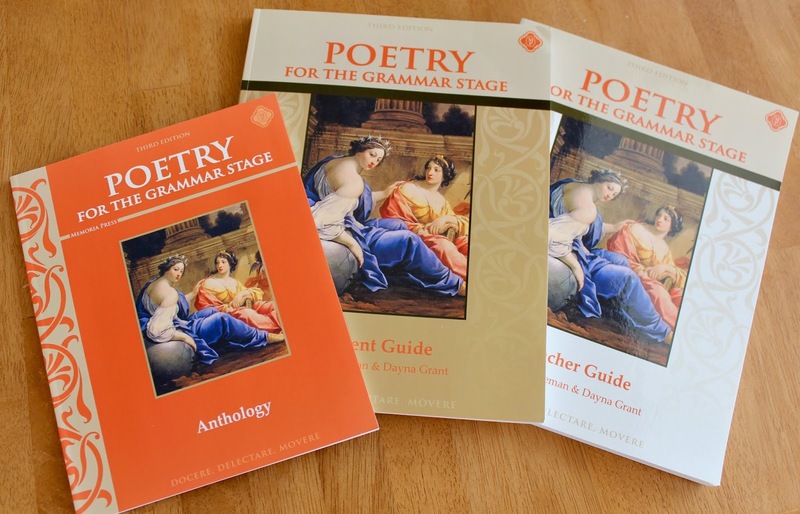 The Poetry for the Grammar Stage Set ($42) consists of three softcover books -- a poetry anthology, a student guide, and a teacher guide. 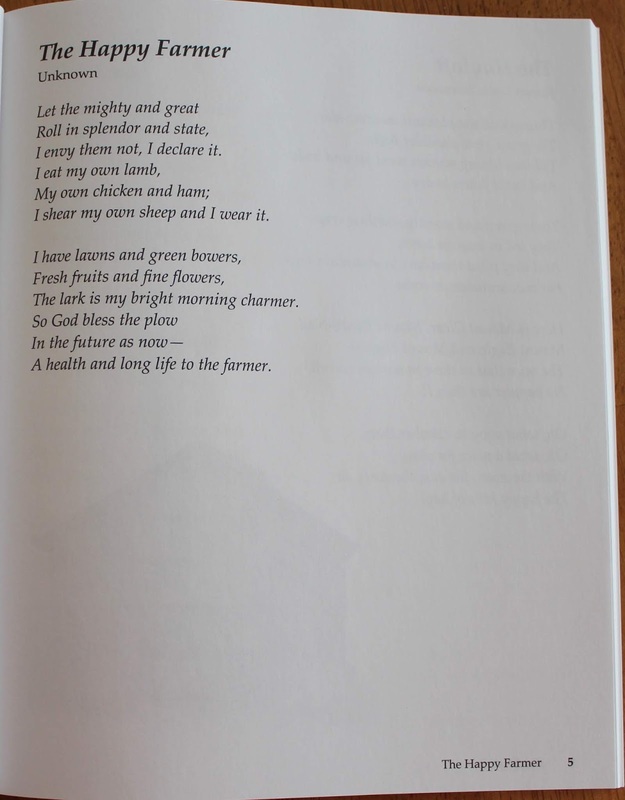 The materials cover 32 separate poems ranging in difficulty from fairly simple, single page poems such as The Hayloft by Robert Louis Stevenson to longer, more difficult works such as The Bells by Edgar Allan Poe. The Teacher Guide lists places where they would naturally fit with other Memoria Press materials, either literature, history, or science studies. I flipped through the books and saw a familiar framework of a printed copy of the poem followed by vocabulary and comprehension questions. 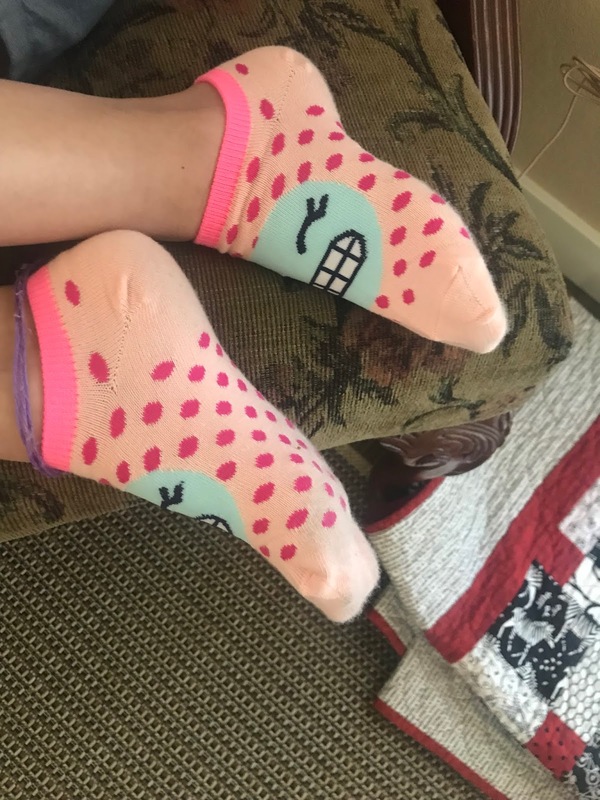 I thought that they could fit in nicely during the part of the day when Lauren works independently. Thankfully, I noticed a single page of notes titled "How to Teach a Poem" at the beginning of the Teacher Guide. It was then that I realized that these materials were not well-suited for a student who prefers to work independently. The Poetry for Grammar Stage Set required me to actively teach much of the materials (regardless of whether Lauren wanted to be working on her own). We adapted the materials a bit so that Lauren could work independently but I could still teach the materials. On the first day, I read the poem aloud to her. Depending on the time available that day, I sometimes had her also read the poem aloud. 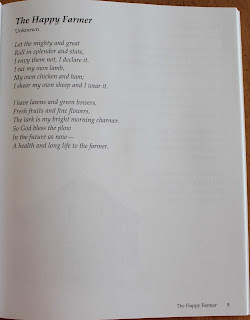 For our initial reading, we usually used the copy printed in the Poetry for the Grammar Stage Anthology. 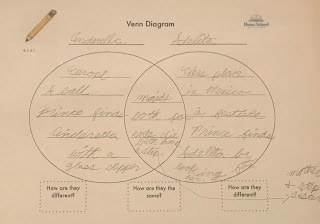 The poem is also printed in the Student Guide with space for the student to draw an illustration and blank lines to use the poem as copywork. Then, instead of discussing the poem right away, I set her loose with the questions regarding the material. I hovered nearby doing housework or whatever so that she could ask me for help as she completed the work. She was more open to me explaining the rhyming structure or terms such as alliteration once she saw a question that she didn't know how to answer. Then, on the next day, we discussed her answers to the comprehension questions. She wasn't willing to discuss the poem on the day I introduced it, but she was willing to discuss the questions and answers after she had made an attempt to do them on her own. It wasn't the way Memoria Press suggested in the teaching instructions, but it managed to work for us. 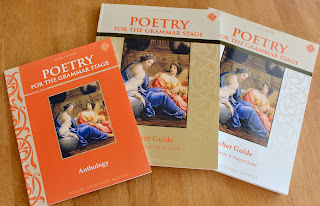 The Poetry for the Grammar Stage set would be better used in a setting where the teacher and student discuss the materials together. At times, it seemed like it might be even better suited for teaching a small group of students where each student can contribute their ideas so that the group as a whole can discuss possible meanings and interpretations. It is possible to make it work with just a single student at home, though, and even possible with a student who is reluctant to discuss what she has read. The thirty-two poems in the book increase in difficulty rather quickly. An older student with some poetry background and with strong reading comprehension skills could perhaps work through the poems at a pace of three to four per week to make a complete study on poetry. In most other cases, I'd recommend using this book as a way to introduce poetry one time per week (finishing the book in a year) or even introducing just eight poems over the course of a school year (finishing the book in four years). Even though this program wasn't a perfect fit for my daughter who insists on working independently whenever possible, other Memoria Press products have been a perfect fit for her. I guess that's why Memoria Press remains one of the homeschool companies that I keep coming back to again and again. If you're interested in learning more about other Memoria Press materials, please click the button below to read other reviews. 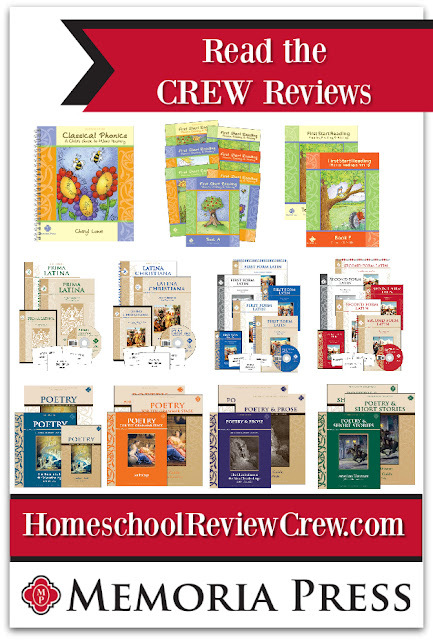 The Old Schoolhouse® Magazine Homeschool Review Crew members have recently looked at their beginning reading materials, some of their Latin offerings, and other levels of poetry. When I look back over our years of homeschooling, I see that we've used products from certain companies nearly every year we've homeschooled. One of those beloved companies is The Critical Thinking Co.™. When Brennan was a preschooler we were introduced to their Building Thinking Skills books, and more recently we've used their U.S. History Detective books for high school. 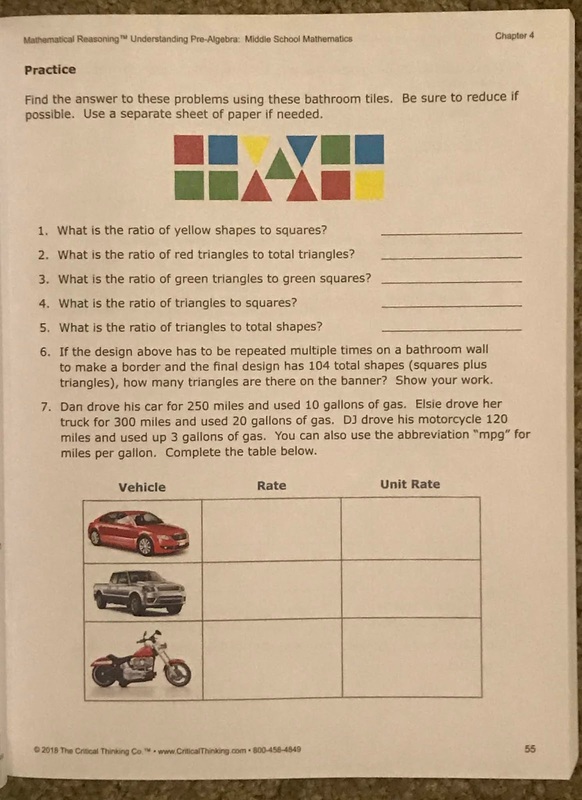 For the past few years, Lauren has used the Mathematical Reasoning™ series of workbooks for additional practice alongside her regular math curriculum. I was thrilled to have the opportunity to review Understanding Pre-Algebra, the next work text in the series. 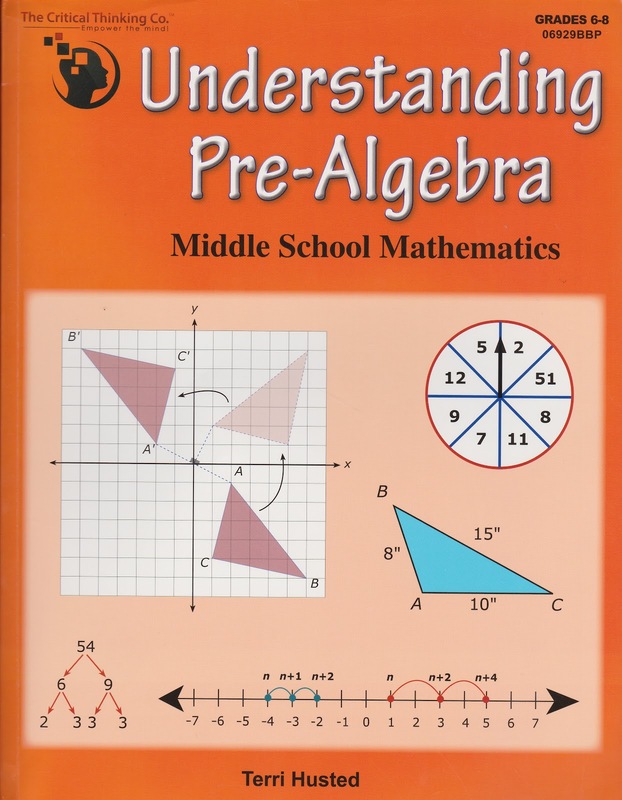 Understanding Pre-Algebra is suggested for Middle School students in grades 6-8. Lauren is just now finishing up her sixth grade year. In terms of math skills, she can confidently do calculations with whole numbers, fractions, and decimals. 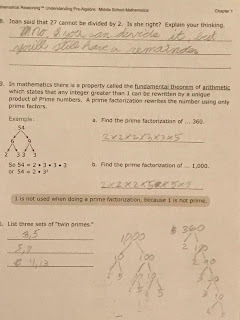 As we continue in her regular math program, she would be starting pre-algebra in the fall. I was confident that she was ready start the pre-algebra material from The Critical Thinking Co.™. 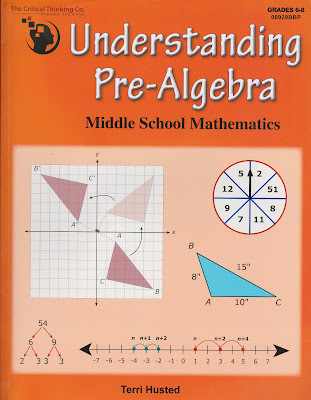 The Understanding Pre-Algebra book is a hefty softcover book (442 pages) that combines instructional materials and practice problems in one volume. It has fifteen chapters and 120 lessons. 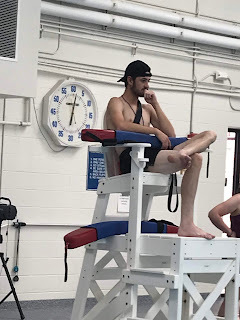 Each chapter has a chapter review exercise that could be used as a test, and the book includes a final examination covering all the material presented in the book. Based on my examination of the materials, it looks like it covers absolutely everything that is covered in any other pre-algebra course. 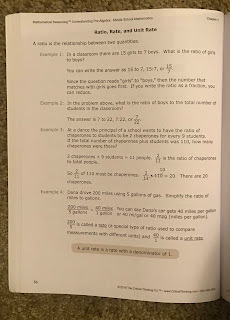 A lesson in this course generally consists of a page or two of text explanations and sample problems followed by ten to twenty practice problems for the student to complete on their own. Answers are provided in the back of the book, sometimes with a brief explanation but the problems generally aren't worked out. I am quite impressed with the materials. In addition to be a comprehensive look at pre-algebra topics, this book requires the student to think through the concepts. For instance, in one of Lauren's first lessons, she was reviewing important divisibility rules. One of that lesson's questions was, "Joan said that 27 cannot be divided by 2. Is she right? Explain your thinking." Lauren need quite a bit of guidance to think through the exact way that question was worded, and eventually I coached her enough that she realized that you could still divide 27 by 2, even if it didn't divide evenly. Unfortunately, as I was discussing the material and some of the questions with Lauren, I realized that she's just not ready for this book. 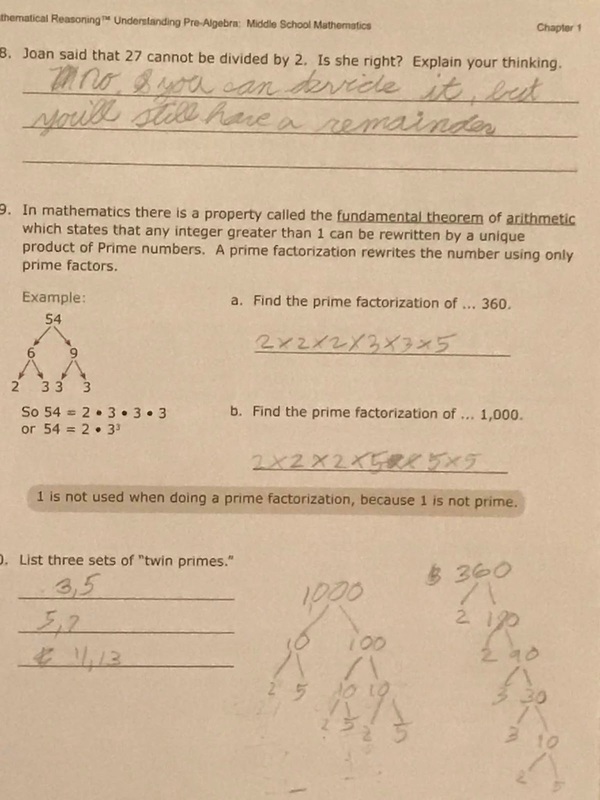 She's done quite well with math in the past, but I don't think she's developmentally ready to move from the concrete world of elementary math to the abstract world of pre-algebra. 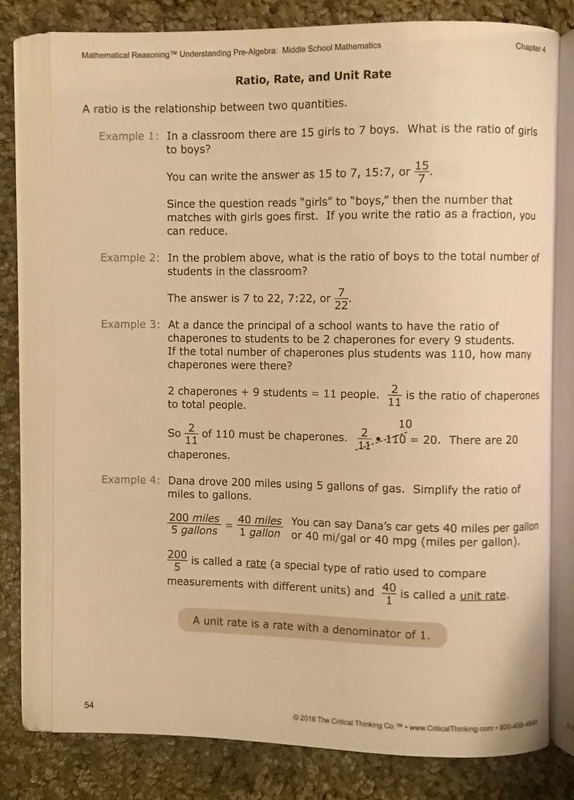 This book introduced a lot of new abstract concepts (natural numbers vs whole numbers vs integers) on the very first page, and she quickly became overwhelmed. She also became frustrated because this book requires a student to either have good reading skills in order to process the teaching section or have a parent/teacher helping with the explanation. Lauren wanted to complete the lessons independently because in the past she's usually done math on her own. It just isn't possible for her to work through this book independently right now. Despite our recent frustrations because Understanding Pre-Algebra is a poor fit for Lauren right now, I continue to highly recommend The Critical Thinking Co.™ materials. I had to set this book aside for now, but I'll hang on to it for when Lauren's ready to tackle the challenge. 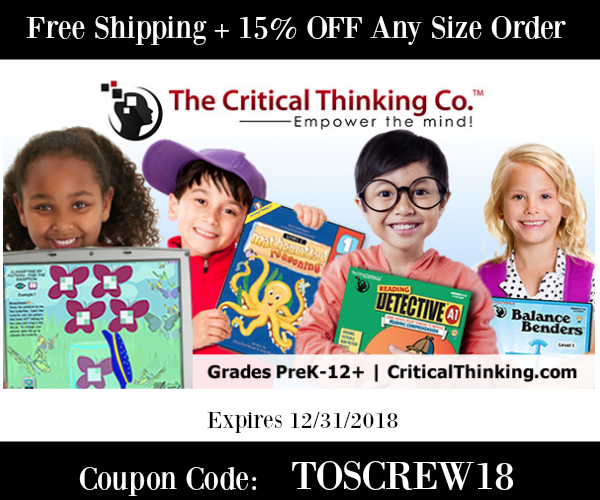 The Critical Thinking Co.™ has generously offered a coupon code for readers to use on an upcoming order (see below). Also, they offer free critical thinking puzzles delivered weekly to you inbox. 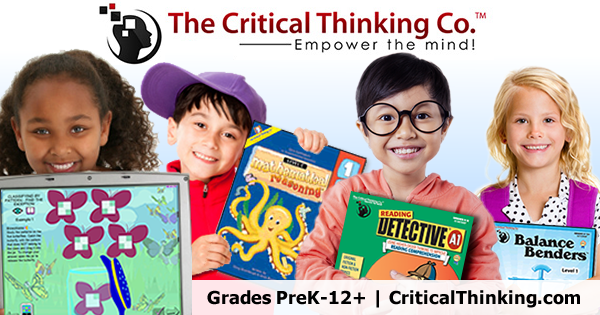 Sign up here and select your appropriate grade level (or levels). When I posted my first day photos back in January, I was thinking about taking a bit of a blog vacation. I didn't expect it to last quite this long. Nothing bad happened. I just needed some time off of the pressures of writing stuff to post publicly. Lately, I've been feeling a bit of a pull to get back to sharing about our life and probably even recording some of the years ago stories that I've never written down. 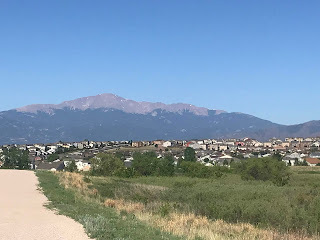 I may not write every week, but I hope it won't be five months between blog posts next time. 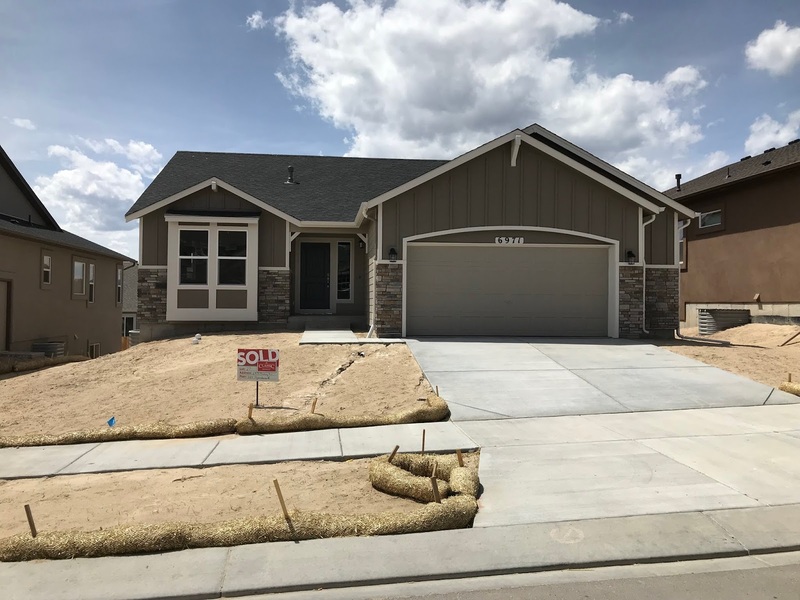 About a month ago, we moved from base housing to the new house we built. It's been a crazy move, and I suspect it'll be a long time before everything is put away. I decided the boxes could wait while we enjoyed the summer weekend. 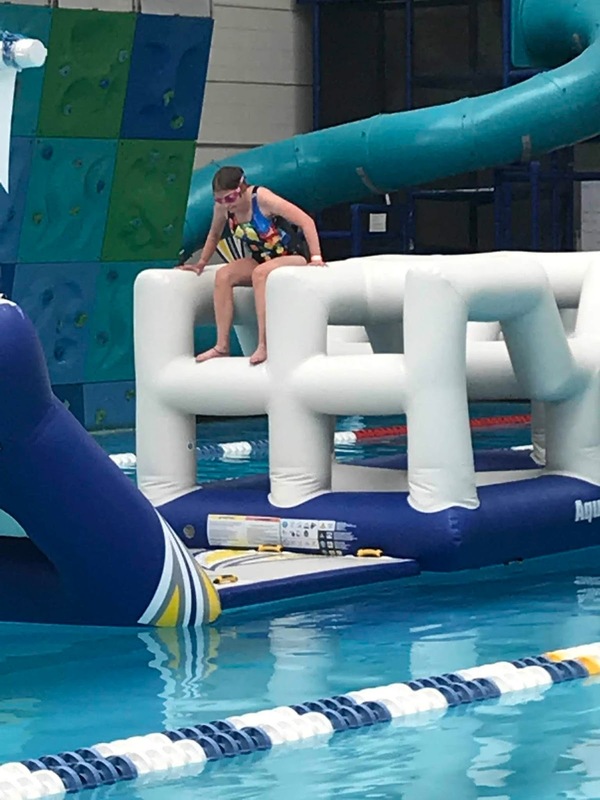 Lauren and I spent a fun afternoon with friends attempting to conquer the inflatable obstacle course at the pool. I also made my way successfully across. I credit years (and years) of ballet class for my balance skills. And lots of good luck. 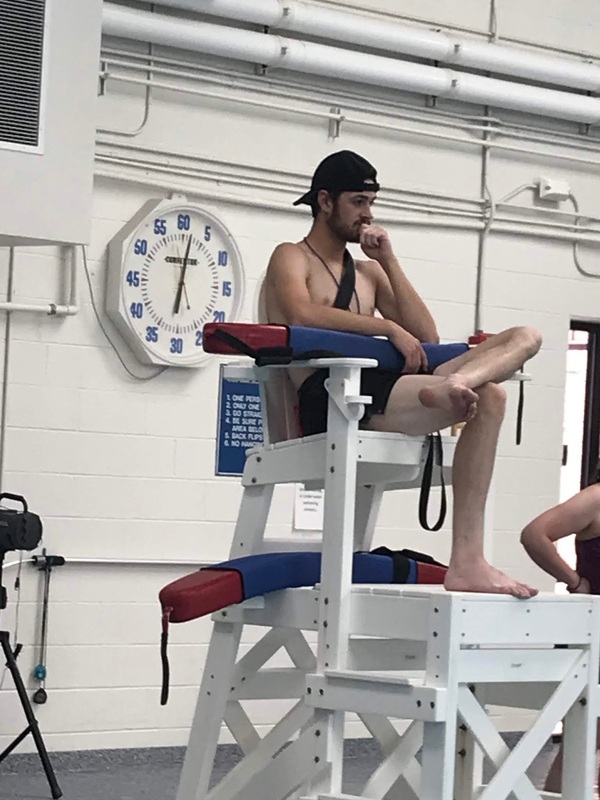 While Lauren, Brennan, and I were hanging out at the pool, Tim was off backpacking with a group of scouts. 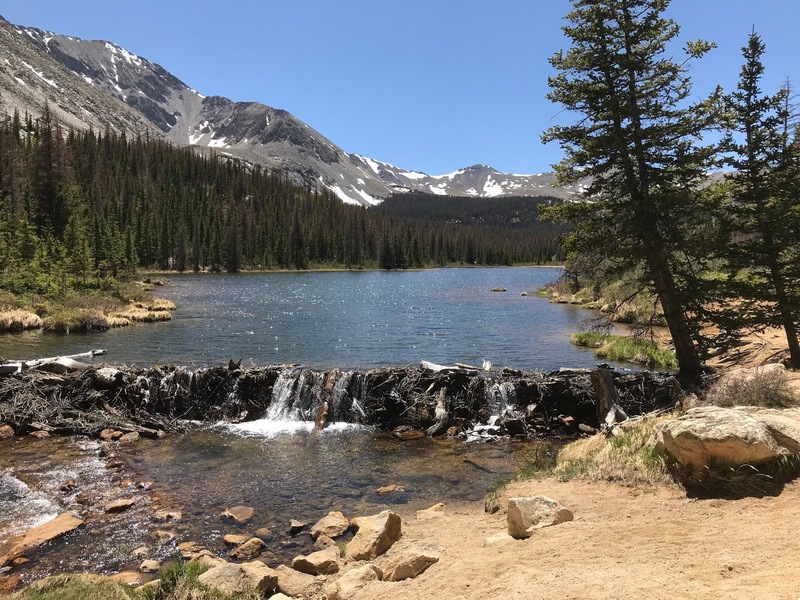 He didn't get any pictures of himself, but kindly contributed this gorgeous photo of an alpine lake they found so that I could include it in my collection. Addison is in Ohio doing engineering research this summer. I didn't ask her for first day pictures. I have a feeling their robotic stuff is top-secret anyway. 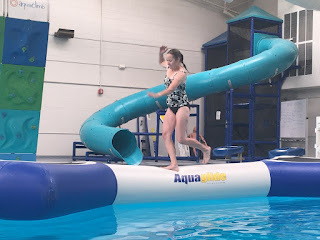 I have a few more blog post ideas brewing, especially as I start planning for our next homeschool year. I plan to continue with first day photos now that I've gotten back on track. 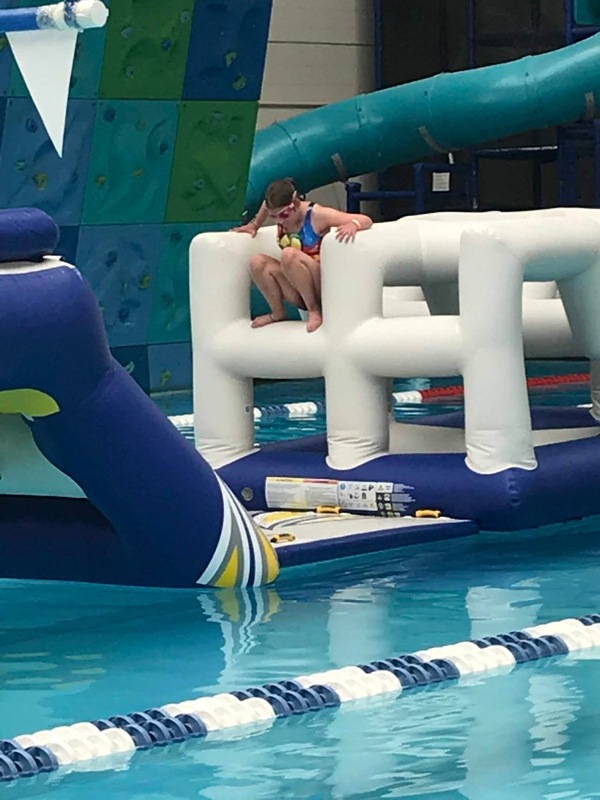 I've missed capturing little things like emoji socks and successful runs across the pool obstacle course. 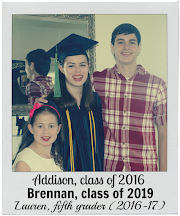 When Addison and Brennan were younger and I was still a homeschool novice, I described my search for a perfect language arts program as searching for the Holy Grail. I was hunting for a program that balanced reading instruction, literary analysis, composition, spelling, grammar and any other topics that I might otherwise forget to cover. As the years passed, I realized that the perfect program didn't exist -- at least not the perfect program for my kids. It became easier to pick piece together several programs, each focusing on a specific subset of the many skills lumped into the language arts description. Recently, I've been searching for a language arts program that will allow me to focus on the gaps Lauren has in reading comprehension skills. 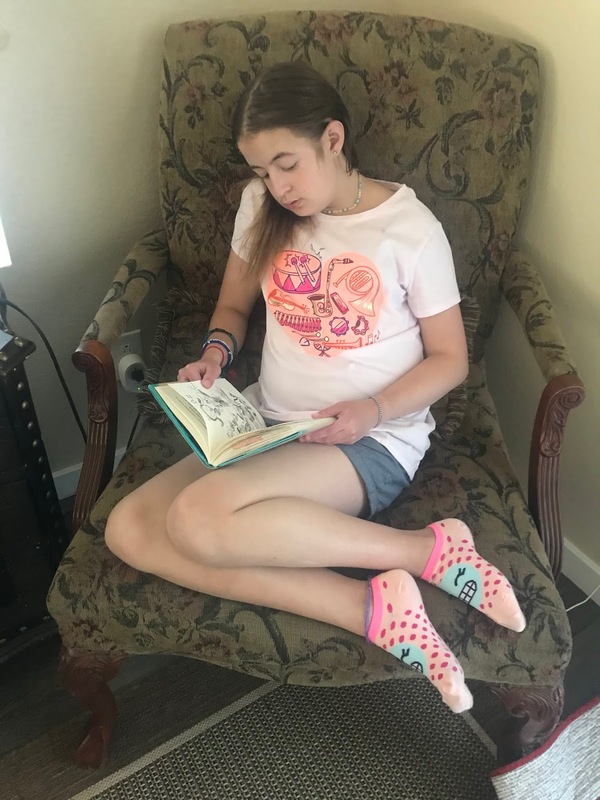 We've been using Home School Navigator Reading and Language Arts Curriculum for the past month to see if we could adapt it to fit her needs and if it would be a good fit for us. 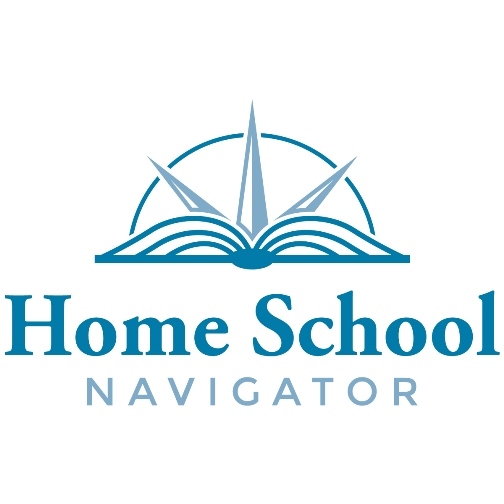 Home School Navigator is a complete language arts program with both online and print components. It includes activities to teach literature, comprehension skills, reading skills, writing skills, phonics, vocabulary, grammar, spelling, handwriting, and even some computer skills. The program is divided into six color-coded levels ranging from red (kindergarten) to indigo (fifth grade). Since I was primarily concerned with Lauren's reading comprehension skills, I decided to back up several grade levels and start with the green lessons. Many of the phonics and grammar skills were far too easy in this section, but the literature and independent reading activities looked to be at an appropriate difficulty level for her. The program is organized by month, week, and then day. From Lauren's online dashboard page, she picked which month/week of the program that she was working on and then picked the specific day on the next screen. 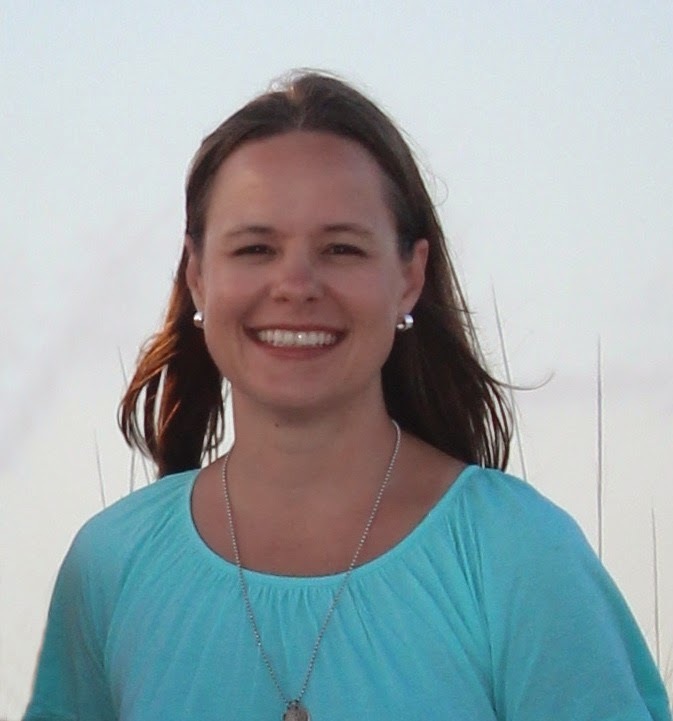 It helped when I made notes in my regular lesson plans so that I could direct her to the correct lesson. "You did lesson 2.1.3 (month 2, week 1, day 3) yesterday so go on to 2.1.4 today." At the end of each lesson, there is an option to mark that assignment complete or to upload the student's work for later access as part of an online portfolio. Since I was not often able to scan Lauren's assignments immediately and since the program would not allow me to upload assignments to lessons she marked as complete, I insisted that she leave the assignments unchecked when she finished them. She was often frustrated that the program was not showing her correct amount of progress because of my delays in uploading scanned assignment pages. The lessons in the first month of the green program focused on fairy tales, specifically different versions of Cinderella. The read-aloud books for the month were picture books showing how the Cinderella story had been told in different cultures. I found most of the books at our public library. For the ones I couldn't find, Lauren watched Home School Navigator videos of them being read aloud. After hearing me read the book, there was usually an activity page that I had printed for Lauren to complete. 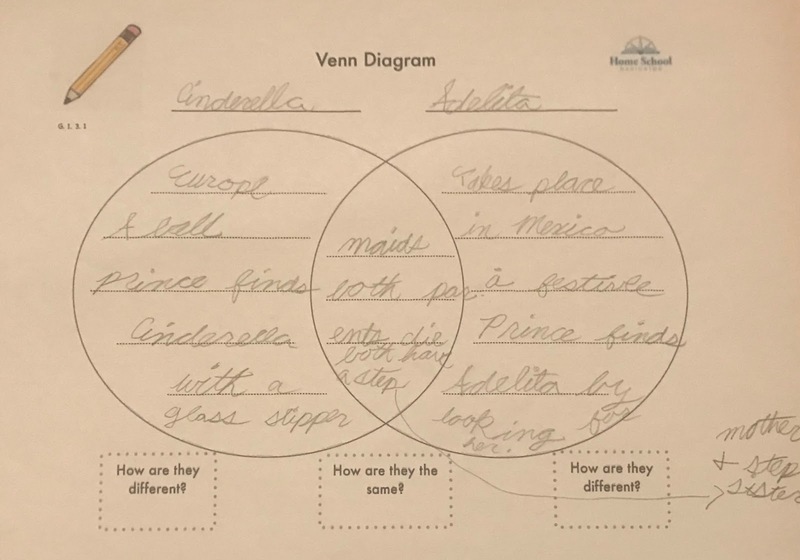 One of my favorite types of activities were the days where Lauren had to use her thinking skills to find similarities and differences between two (or three) books in order to complete a Venn Diagram. Thinking back on the story and remembering details is one of the skills I hoped to strengthen by using the program. As a veteran homeschool teacher (with a background in early childhood education), I'm fairly confident in my ability to discuss picture books. At times, however, I wished that the program gave me some additional guidance in terms of things that I could point out to Lauren, topics we should cover in our discussions, etc. 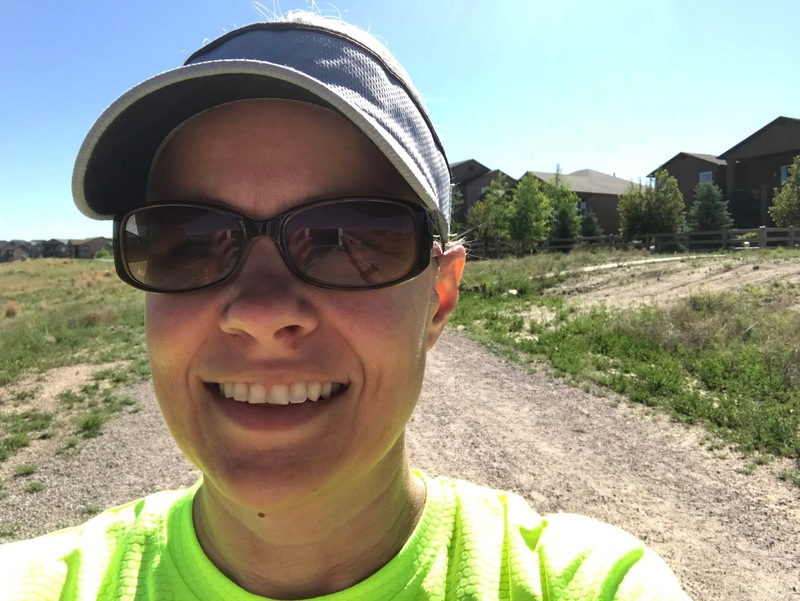 While I loved reading aloud and discussing the picture books in the first month of the program, I switched gears and jumped ahead a bit so that I could prepare some materials to use while we were offline for a few days during our move. 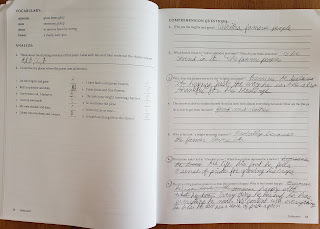 A big component of the upper levels of Home School Navigator is their interactive book study notebooks. These sets of study materials are available as part of the complete program and can also be purchased separately as pdf files to download. 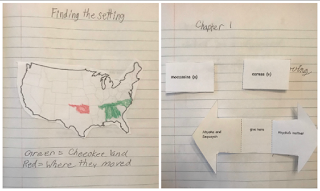 Once I downloaded the first interactive notebook, we were able to work on it without needing to access the online materials in Home School Navigator. Lauren's first interactive notebook was based on the book Ahyoka and the Talking Leaves by Peter and Connie Roop. I was quite impressed with the introductory materials for the book. Lauren and I spent quite a bit of time exploring the recommended website to get background information on the Cherokee people, Sequoyah, and the development of a Cherokee syllabary to make written language possible. The rest of the book study follows a fairly predictable pattern of reading a chapter of the book and then completing the printed activities. Much to Lauren's dismay, the program recommends reading the chapter aloud to a parent instead of reading it independently. From a parent standpoint, I think it's a great idea because I'm now getting a better idea of her reading skills. Each day's assignment includes some vocabulary words to define. 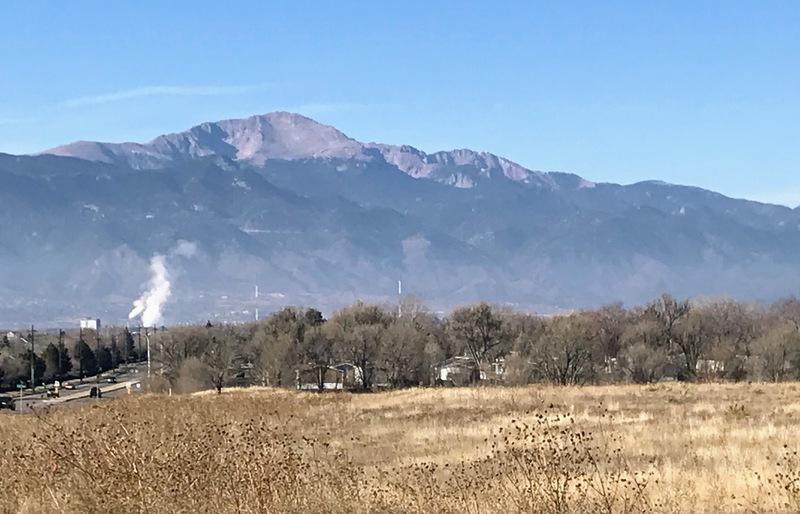 In addition, there is always at least one more question that either relates directly to the story (write some of the main character's character traits) or teaches a new skill for literary analysis (find two more examples of similes in this chapter). 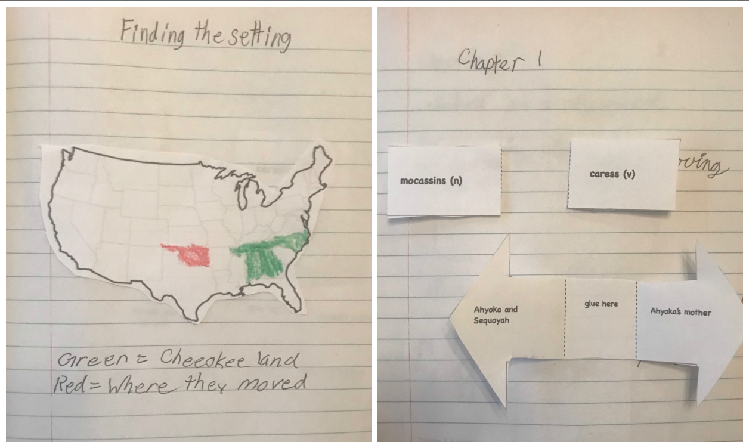 The interactive notebooks are the piece of the complete Home School Navigator program that will help us the most in terms of building reading comprehension skills. Lauren seems to do well with a read-then-anwer-questions approach, and the interactive notebook is a bit more fun than just filling out pages in a workbook. I am looking forward to some of the later studies, both ones in the green level and in later levels. Future book studies include 26 Fairmount Avenue by Tomie dePaola, The Invention of Hugo Cabret by Brian Selznick, Sadako and the Thousand Paper Cranes by Eleanor Carr, Because of Winn Dixie by Kate DiCamillo, and several other old favorites. It's an exciting line-up of chapter books for us to look forward to studying over the next few years. The complete Home School Navigator Reading and Language Arts Curriculum costs $97 per year and includes access to all the levels. (I believe it also includes access for up to four individual students in your family, but I've only been using the program with one.) The interactive notebooks are included as part of the lessons in the regular program and are also available to purchase separately for $8 each. 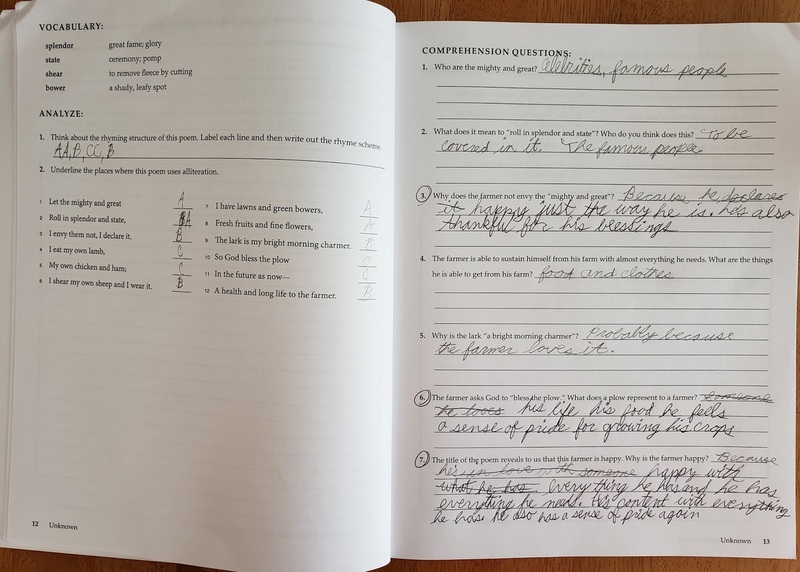 If your primary concern is improving reading comprehension and building literary thinking skills, it might be wise to focus on the interactive notebooks. 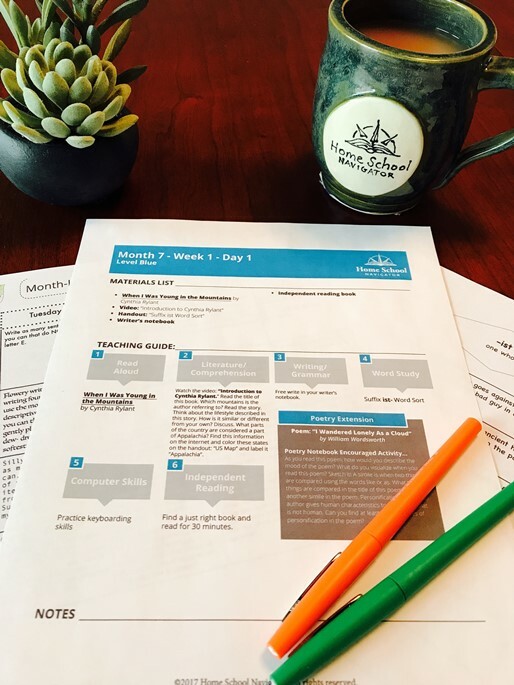 If you are looking for a compete Language Arts Curriculum, I think you'll find that Home School Navigator has enough materials in their lessons to meet all your needs. 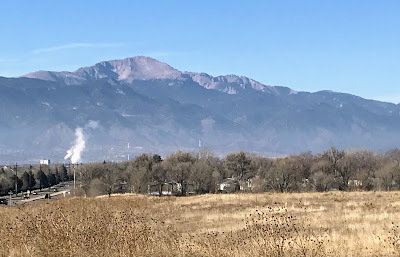 With the holidays behind me and a new page on the calendar before me, I am recommitting myself to blogging more often than every once in a blue moon. I decided to resurrect my First Day Photos habit. Alas, I got distracted by New Year's Day food preparations and then a very intense college football game (a well-fought effort by the Sooners). 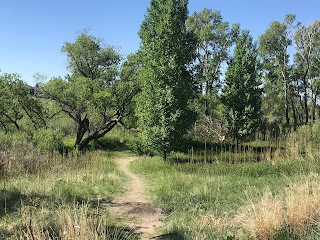 I did manage to get a handful of snapshots to share this month. I was thankful to have some help in the kitchen (even though Addison maintains that fudge is the absolute easiest thing in the world to fix). 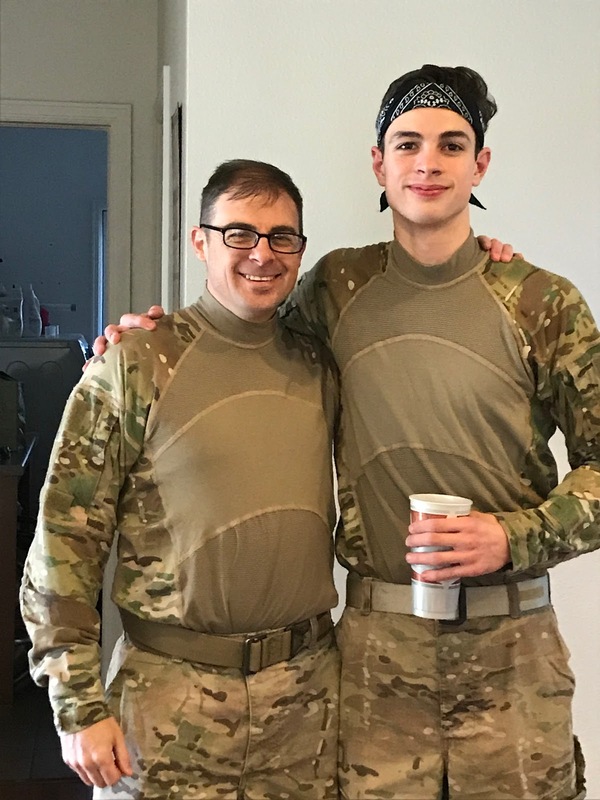 Meanwhile, Tim and Brennan braved the cold weather for an outdoor laser tag battle with the teens from church. Here's to an exciting year ahead of us! As I was driving last night, I realized how different life is this December. Our fall was rather crazy as we tried to settle into a somewhat consistent school schedule while still juggling umpteen doctors appointments and countless hours driving between here and Denver. Our activity calendar this December is actually legible. For the past few years, our Decembers have been packed with choral events. 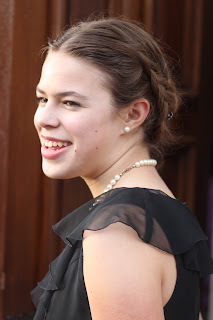 For the three years we lived in Arizona, Addison sang with the Advanced Choir in the Tucson Girls' Chorus. Their holiday season officially kicked off with the big concert where they were invited to sing with some of the choral groups at the University of Arizona and continued through all sorts of other performances that month. The next year, Lauren joined TGC as a Ladybug. Addison still had lots of holiday concerts, but we were sometimes able to hear both girls sing on the same night. When we moved to Colorado, we traded Tucson Girls Chorus for the Colorado Springs Children's Chorale. Again, like most performing organizations, we spent our Decembers hustling from one event to the next. 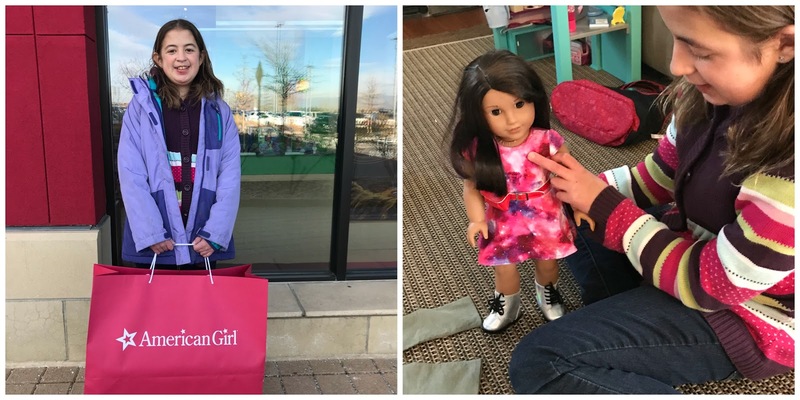 In Colorado, though, it was both Lauren's and Addison's group that had packed schedules in December. This year Lauren isn't singing with the chorale. It was just too big of a commitment for a little girl who misses so much for doctor's appointments and hospital stays. And so, our December calendar that was once packed with music looks a bit bare this holiday season. I don't miss the crazy drives all over town, but I do miss the concerts, the singing, and the smiles. Perhaps most of all, in the midst of the all the silent nights I have this December, I miss hearing my girls singing Silent Night. We decorated our Christmas tree last weekend. Lauren put her magnetic countdown to Christmas calendar on the refrigerator and is anxiously waiting for December 1st. I just needed to figure out what I was going to do in terms of schoolwork during the month of December. I'm sure we'll read The Best Christmas Pageant Ever again, but I know it doesn't take very long. I briefly thought about dropping our regular work and embracing some sort of unit study with reading assignments, artwork, and project. Then I took a look at our December calendar and had a big reality check. There just isn't any way I can take on that sort of craziness this month. I needed something simple, but I also wanted something educational and fun. 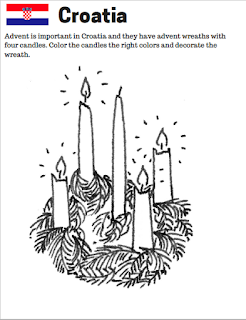 I found exactly what I wanted when I heard about Christmas Around the World from The Awe Filled Homemaker. 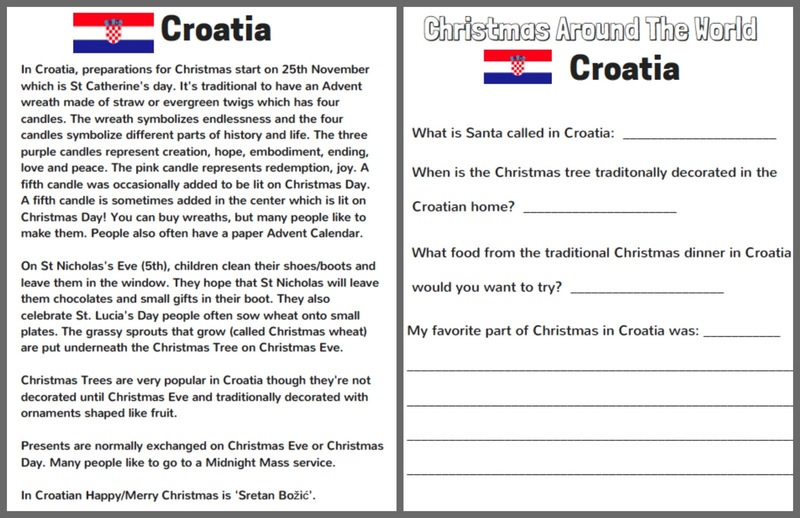 Christmas Around the World is a 70-page printable study covering holiday traditions in virtuous countries around the world. The study covers 20 countries over the course of 24 days. For each country, there is a single page information sheet which is usually three or four paragraphs long. 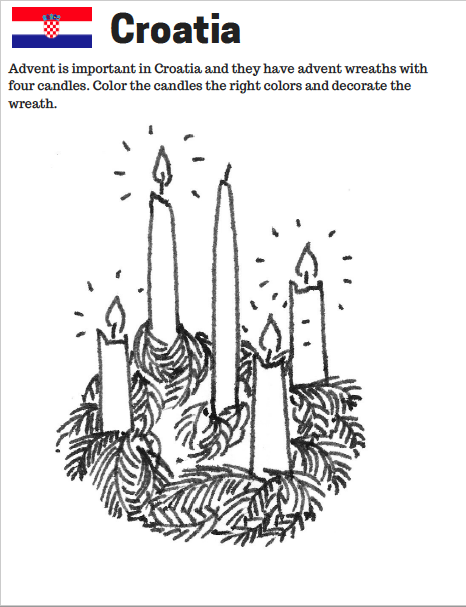 The next page consists of a few simple questions that relate back to the reading passage. The first three questions are somewhat varied, but the child is often asked, "What food from the traditional Christmas dinner would you want to try?" The last question always asks the student to list a favorite thing that they noticed while reading the passage. For Lauren, I may tell her that she simply needs to put down an interesting fact that she learned while reading the passage. Finally each day includes a simple art or creative activity. Very simple. Just the what I need for this busy season. Most of the days include a bit of coloring or drawing. For France the activity is to decorate the yule log cake and for the Philippines it is to decorate the parol. I printed out the entire packet and have it ready for Lauren to start on December 1st. I realize that working through one section a day will require her to work on weekends in order to finish during the Advent season. 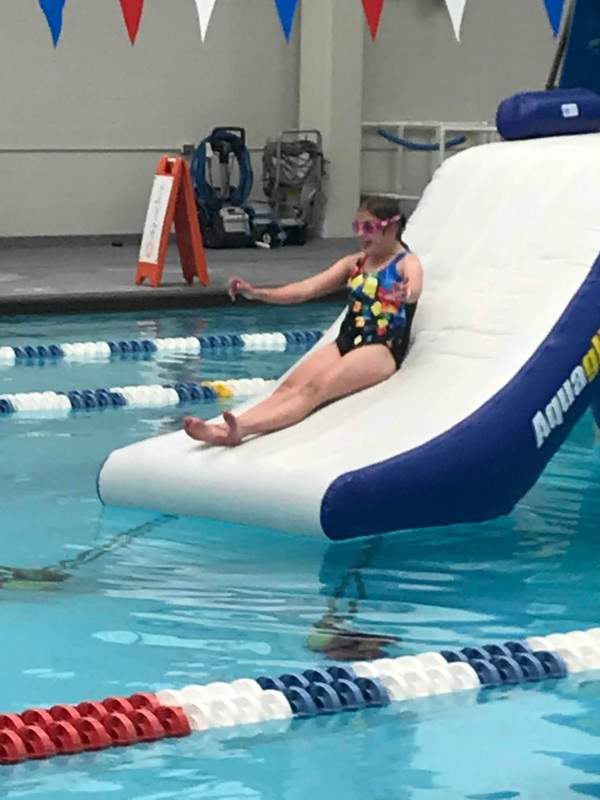 Fortunately, each day's work is short enough that she can double-up on weekdays and not have to do schoolwork on the weekends unless she wants to. Christmas Around the World is the perfect solution for this holiday season. 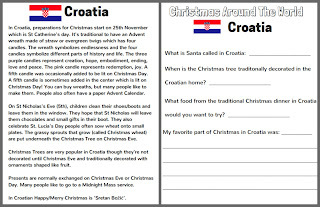 I can add a bit of holiday fun to Lauren's school days without adding planning stress for me. It's a win-win! 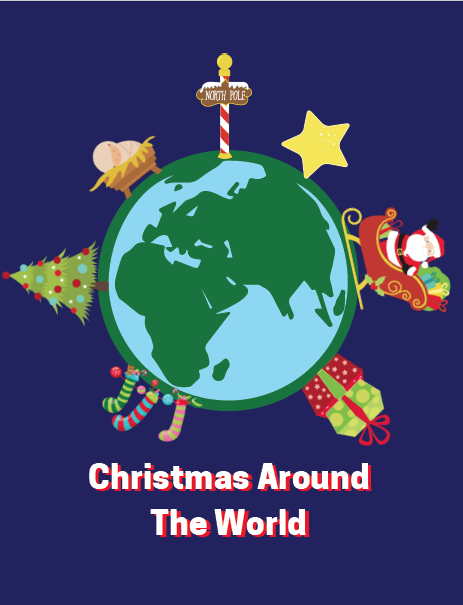 It's not too late to order your own copy of Christmas Around the World for only $14.99. Disclaimer: I received a free copy of this product in exchange for my honest review. I did not promise to write a positive review nor did I receive any additional compensation. All opinions I have expressed are my own. I am disclosing this in accordance with FTC regulations.